Thinning hair is not a problem if you know the right way to style it. An good hairstyle, haircut, and accessory use disguise thinning hair and give you the volume, thickness and fullness you long for. The best way to disguise thinning hair is to start with a great haircut. A professional stylist can help you choose the most flattering haircut but generally shorter styles use choppy layers to add volume and lift around thinning areas and longer styles can be utilised to cover over thinning spots. You can also opt for a longer style that incorporates shorter layers underneath to lift the top layers and add volume. Once you have a good haircut you can change your styling techniques to get the most thin hair coverage. Hair teasing, where a small comb is used to backcomb the hair strands from end to root, can add Thickness And Volume. This styling technique is most effective if you work with smaller sections of hair. Just gently comb the hair towards the root to bunch up hair strands to add thickness and volume. For added coverage and volume you can also blow-dry your hair upside down. For the most lift and volume start with damp, but not wet, hair and apply a thickening agent like mousse, cream, or gel to the roots of your hair. Next, tilt your head forward and aim the heat at the roots until your hair is completely dry. Flip your hair back up and spray with a medium to strong hold hair spray to lock the volume into your style. Finally, styling products that are formulated to add fullness, volume, or thickness can quickly and easily disguise thinning hair. Thickening shampoos and conditioners work to plump up each individual hair strand and add overall volume and lift. Mousses, hair creams, and thickening gels can be applied add height to limp or thin hair, increase hair strand thickness, and boost the look of fullness. When your thinning hair needs more help than a simple styling fix can give it, it may be time to consider chemical treatments. Permanents and hair colours treatments can instantly boost the fullness of hair and give the appearance of thickness. 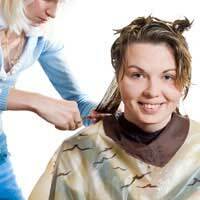 Permanent waves will lift the hair strands and allow less hair to cover more area of the scalp. Plus, the curls or waves can be styled over thinning spots to disguise the loss of hair. Hair dyes thicken hair by depositing colour in the hair strand, which plumps the hair shaft. This boost in hair strand size helps produce thicker looking hair that offers more complete scalp coverage. Hair colour can also be used to give the illusion of fuller, thicker hair. Darker hair colours produce an illusion of having more hair, and lighter colours that better match the skin colour of the scalp help blend thinning areas in with existing hair. Well-placed highlights can also be used to produce the illusion of fullness. Having the tips of your hair highlighted will make the root colour stand out more, thus tricking the eye into seeing more depth and volume. If you need a quick way to disguise thinning hair spots hair accessories may be the best option for you. To hide thinning at the crown a wide headband can be used to pull hair from the front of the hairline back and over the problem spot. Barrettes, hair clips, and scarves can be used to pull hair form different areas of the scalp over thinning areas to hide baldness and provide volume or lift. Finally, certain styles such as braids, ponytails, buns, and updos can be used to pull thicker hair over thinner spots and hide visible areas of scalp. You can get even greater coverage for thin spots by utilising hair accessories that include Fake Pieces Of Hair. Many styles of headbands, barrettes, and clips feature sections of synthetic hair that can be purchased to match your existing hair colour. By placing these pieces in your hair you can add the look of volume, fullness, and thickness without permanent alteration to your natural hair. Learn how to keep your hair in great condition despite hair loss by reading our article Styling to Protect Hair.